Did you know that it’s possible to get car insurance by paying a tiny down payment? 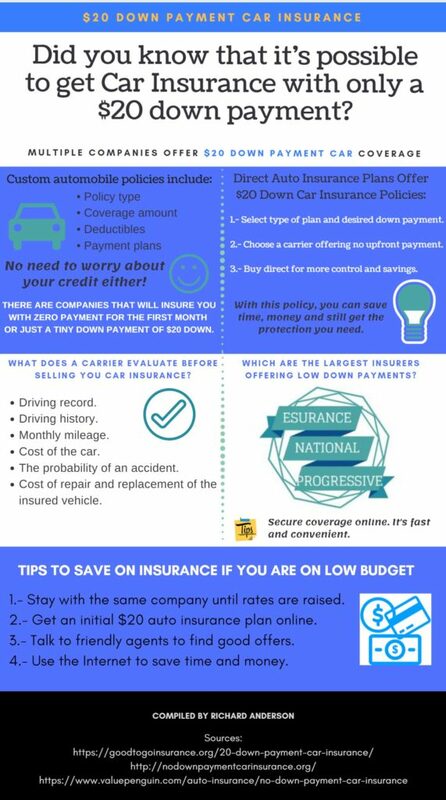 While there are multiple companies that offer a $20 down payment car insurance program, a lot of these plans should be purchased directly through the company website online. However, there are plenty of insurance agents and brokers that can offer assistance in getting insured with a minimal deposit. If you are tight on cash and still need to get covered, then this might be a smart option for you. With these policies, you can decide what your budget is, what kind of coverage you want, and what payment plans you’re able to afford. Planning can save you not only money but get you the protection you need. With direct auto insurance, you can select the type of plan you want along with your desired down payment. You can select from carriers that offer car insurance with no upfront payment. One of the many benefits of buying direct is control and savings. If you are uninsured, it’s important that you get covered as quickly as possible. If you don’t have much money to put down, then don’t worry. There are direct carriers like Young American Insurance Company that will insure you with zero payments for the first month. With deals like this, there is no excuse to not have auto insurance. There are consumers that feel more comfortable putting down a deposit. This is why there are policies that offer auto insurance for a very low down payment. Credit plays an increasing role in auto insurance pricing. Those consumers who have good credit can get the cheapest auto insurance with no deposit. If your credit is not perfect, don’t worry. There are several national providers that have good deals for those with less than perfect credit. You still can qualify for a low down payment plan online. The type of car that you own can determine how much it costs to get insured. If you own a luxury or sports vehicle such as a Corvette, you likely won’t be able to qualify for coverage that allows for no money down. The insurer knows that if you own an expensive high-performance vehicle, chances are you will on occasion, take some risks and drive aggressively. Plus, high-performance automobiles are more likely to get into an auto wreck, causing damage and injuries which require a higher level of coverage. Get sports car insurance for $20 down online. Check out the rates at Young America Insurance new website. There is a solution for those consumers that can’t afford to make any payment, but still, need to get their vehicle insured. The first thing you need to do is look for auto insurance carriers that specialize in no money down coverage or have a very low requirement, like $20. Now, this is where it gets a little bit tricky. Whether you qualify for a low down payment auto insurance will depend on a few things. The first of which will be the make, model, year and type of car you plan on getting insured. For example, you probably can’t call up an ins provider and try to get a Corvette sports car covered with nothing down. This isn’t realistic because the insurer knows there is a higher chance of a “high performance” automobile getting into a wreck and causing serious damage and injuries. However, if you have a used Toyota Corolla that you only drive 400 miles per month, then you have a shot. Also, if your vehicle is new and costly, then there is less of a chance you are going to be able to get a policy with nothing down. When you buy auto ins, the provider is taking a risk and betting that you won’t get into a wreck. This includes calculating many factors of risk, like repair and replacement costs. If you have a new BMW that costs $60,000, then you probably won’t need anything down car insurance and that’s a good thing because it is not likely you could find it. Getting the cheapest car insurance down payment requires being less of a risk to the companies. The less likely you are to get into an accident then the more willing an insurer will be to offer incentives on the policy. Another factor that comes into play is credit. These days auto insurance firms are placing a higher degree of weight on a person’s credit rating. The theory goes that someone who is responsible with their money will also be a responsible driver. So in order to qualify for new $20 policies, you need to make sure your credit is in good standing. If it is not, then take aggressive steps to get it fixed. It will not only help you with cheaper car insurance but so many other things. On the other hand, if you own a used Toyota Camry or similar automobile, you can get cheaper premiums. In addition, if you only drive a few hundred miles per month, then you are far more likely to qualify for no money down auto insurance. Newer and more exotic and higher cost vehicles are harder to insure with zero down auto insurance. If you want the best auto insurance plans for your budget, you need to prove to the insurance companies that you are less of a risk. The less probable it is for you to get into an accident, the more willing the insurer will be to offer discounts on down payments. This will save you money in the short run and long term. Unfortunately, credit is a large factor that plays into your chances of getting coverage for low monthly payments. This is because most insurance companies believe that the better the credit score, the more responsible the person is. So if you want to qualify for a $20 down automobile policy, you will likely need to have a good credit score above 650. If it isn’t good, you should work hard to improve it as quickly as you can. There are a few of the well-known insurance carriers that offer auto insurance policies that include instant auto insurance no down payment. The largest U.S. based insurers like Esurance, Nationwide, and Progressive offer these kinds of deals. You can also secure coverage online, which makes it fast and convenient. Before you settle down on an option, it’s essential that you understand the pros and cons of each policy. Make sure you do solid research to understand what you’re investing in before you make your final choice. Instead of going with one of the biggest companies, look for other companies such as regional insurers like Good to go insurance, as well as the big guys like Geico and 21st Century. Those who purchase policies that include $20 down payments should expect to pay more. The carrier is taking a risk and insuring you for less than the normal market price, in hopes you continue to pay over the course of the policy. This implied risk is offset by the insurer in the way of higher rates. A simple way to save on auto insurance is to pay the entire premium up front. This could be a 6 or 12-month plan. If you decide to do this, you will get a reduced rate on the policy, usually 2% to 3%. Regardless of whether it ends up being a more expensive plan, reduced down payment auto insurance packages are a lifesaver for customers who have extremely low budgets. Everyone that drive is required to get their vehicle insured. This is the best way to get auto insurance as quickly as possible when you have no other financial options. You have the opportunity to renew the same policy with your company over and over again. A lot of insurance carriers will provide renewal incentives to new customers. This is a key benefit that you should not overlook. If your insurer raises your premium, then you should shop around and try to get better rates. The easiest and fastest way to obtain a discounted $20 down payment automobile deal is to search the web. For example, the Progressive Insurance website offers tons of payment plans between $0 and $40 down for first-time customers. Their site is one of the best for browsing custom plans, including great advice on coverage amounts. Plus, you can alter or change your plan anytime and make payments directly online. If you feel more comfortable working through an agent rather than looking online, you’re in luck. There are many friendly agents that work for direct insurers that can assist you with obtaining quotes. They can also help you with any questions you have, which can be helpful. Agents can also help you find discounts you otherwise might not know about. What insurance customers have found most helpful about direct to consumer auto insurance is it saves so much time. You can apply for free quotes through the major insurers in just a few minutes, from the comfort of your home or car. Using your phone, you can get quotes from almost anywhere in the world! When speaking to an agent on the phone, you can be on hold for 30 minutes or more without even being able to compare quotes yet. The best way to get the best rate is to comparison shop through the web. There are many benefits as well as drawbacks to this kind of a plan. If you’re looking for a low-budget auto insurance opportunity, then you need to know what you’re getting yourself into. For example, you might think you are getting a great policy with no down payments required. However, you could end up paying $150 a month for the next year, which comes out to $1,650 in total. This is more expensive than a plan with higher down payments. For example, a plan that offers car insurance first month, but only $110 a month for the next year will total out to $1,410, which is over $200 cheaper. Of course, for some customers, there is no opportunity for wiggle room. If your budget is tight but you need insurance right away, the no down payment plan might be the only option. You’re more willing to pay a little more for the following months since you’ve been given the opportunity to pay nothing up front. You should think about purchasing liability only coverage as well if you need the cheapest possible rates. The state’s minimum coverage requirements can be as low as $29 per month, which is less than a dollar a day. Keep in mind though, it might not fully cover you, in the event you get into a major wreck. The great thing about getting quoted online is that there is absolutely no incentive to purchase the coverage right then and there. You just have to put in some of your personal information, get the quote, and then repeat the process for the next insurance company you’re considering. It’s a good idea to get quotes from up to 10 insurers. This will help you get cheaper auto insurance with low down-payments. When you select a company and a price range you like, you can start looking at individual components of the plan and buy it you’re ready. When someone chooses an installment plan to pay for their coverage, they are required to put a down deposit to get the policy started. This often includes the first month’s payment amount. However, there are different ways to pay the bill and different amounts that can be selected. The great benefit of buying a policy direct is that you can make payments online too. When researching the cheapest car insurance with no down payments, you need to compare the monthly premium payments. Almost all national providers have this option. Many people don’t have $1,000 or more saved up to pay for their auto insurance premium upfront. You can even set up direct deposit payments. Fund will automatically be taken out of your bank account each month on the day you choose. If a problem arises, you can cancel anytime. You can avoid additional fees by using your credit card each month. This will prevent costly fines, in the event your account is overdrawn. It’s up to you to decide which payment option you prefer. Liability – This is a basic, limited type of car insurance that will compensate for another party if you caused an accident. Collision – This is great protection if you are in an accident, but is more expensive than liability insurance. Comprehensive – This will give you the broadest scope of coverage. It is usually purchased alongside collision insurance. It gives you coverage for anything that damages you or your vehicle, other than hitting another car. This includes damage from the elements and vandalism. It’s more expensive, but the most recommended type of insurance for new cars. Once you choose the type of insurance you want, you should also consider additional options such as medical cost limits and gap auto insurance for financed vehicles. Gap can help you in the event you get into a vehicle a few months after buying a car that has depreciated quickly. When you need auto insurance with no upfront payments, it’s time to do some research. The best place to look for the best deals is through comparison sites like Young America Insurance. You’ll find the lowest rates, which start at $20 for the first month. Get started now and buy cheap $20 down auto insurance online.